Over its six decades two opportunities have been taken to record IAH’s history, briefly summarised below. The first was an article written in 1992 by John Day, a former Vice President of IAH and published in the first edition of Applied Hydrogeology, which is now the Hydrogeology Journal. More recently, a comprehensive history of the association from its establishment in 1956 to the present was prepared under the guidance of former IAH President Willi Struckmeier. This was also published in an article in the Hydrogeology Journal in August 2016. The original aims of the association, as set out in the statutes of 1957, were defined as “uniting all scientists interested in hydrogeology; holding scientific meetings and publication of worthwhile scientific results.” The revised statutes of October 1975 slightly modify this as “to promote co-operation between geologists and specialists in all disciplines who are interested in hydrogeological problems”. So, while hydrogeology was obviously at the core of IAH’s activities, it was recognised from the beginning that collaboration with colleagues from other disciplines would enhance the association’s ability to contribute to improving the scientific understanding of hydrogeology. This ethos still remains throughout the association today. 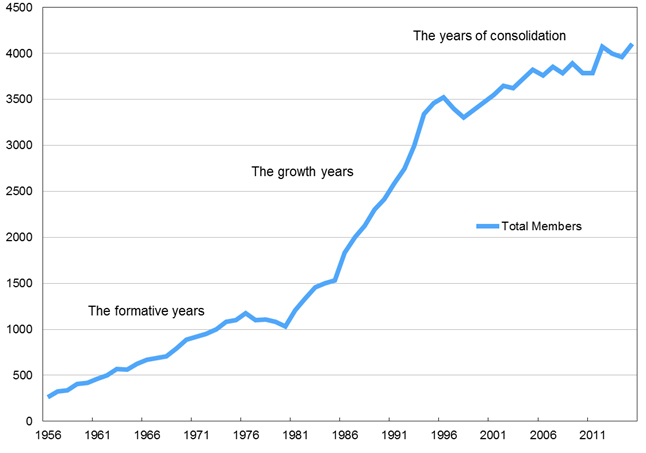 Membership grew quite slowly during the 1960s and 1970s and then more rapidly, more than doubling during the 1980s as the importance of mapping and investigating groundwater resources and developing new supply sources became more widely recognised and the number of groundwater professionals increased. Congress themes, book titles and IAH commissions during this time largely reflected this emphasis. 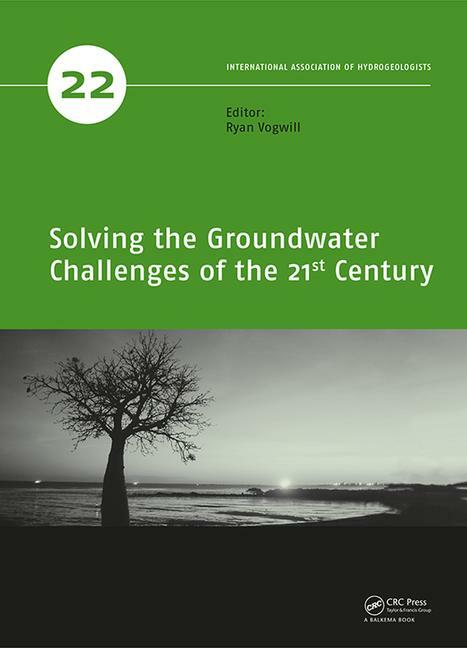 More recently, the increasing importance of managing groundwater resources and protecting aquifers from pollution have produced evolving scientific directions in hydrogeology which are reflected in the titles of IAH’s congresses and books. The changing emphasis is also reflected in the IAH mission to further the understanding, wise use and protection of groundwater resources throughout the world. 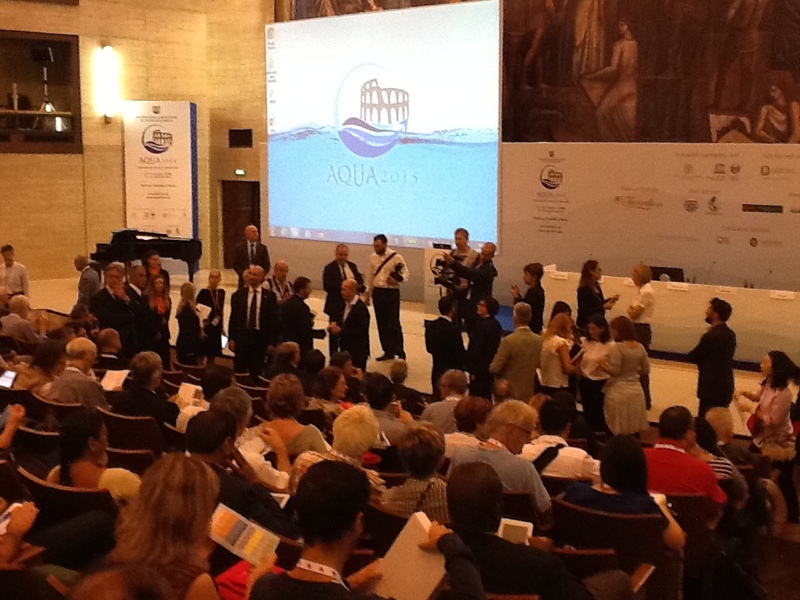 It is seen in the growing need for a responsible professional association to advocate for better awareness of groundwater amongst policy makers, the general public and professionals in other disciplines. Although not forgetting that IAH‘s roots are firmly in the geological sciences, the Association now attracts a broader range of professionals working in groundwater. In more recent years membership has spread more greatly, to more than 130 countries, making IAH truly a global organisation. As at the end of 2016 IAH’s membership stood at over 4100. The association held its first Congress in Paris in 1957, with its 43rd taking place in Montpellier in September 2016. Over the years the congresses have taken place in numerous countries all around the world, upholding IAH’s commitment to reach as broad a geographical spread as possible. 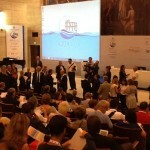 In recent years, congresses have taken place in France, Italy, Morocco, Australia, Canada, Poland, India, Japan, Portugal, and China (in reverse order). 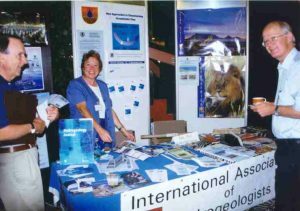 Although IAH is an organisation of individual members, we have always encouraged the formation of national groups or chapters. The first national group was set up by Paul Fourmarier in Belgium in 1958 and chapters in France, Spain, Italy, Czechoslovakia, Germany and Yugoslavia followed in the early 1960s. We presently have 45 national chapters and are always endeavouring to support the establishment of new ones throughout the world. One of the earliest (established in 1959), longest running and most productive of IAH’s commissions was that devoted to hydrogeological maps, and the International Legend developed by commission members was an important contribution which still serves as a model throughout the world. 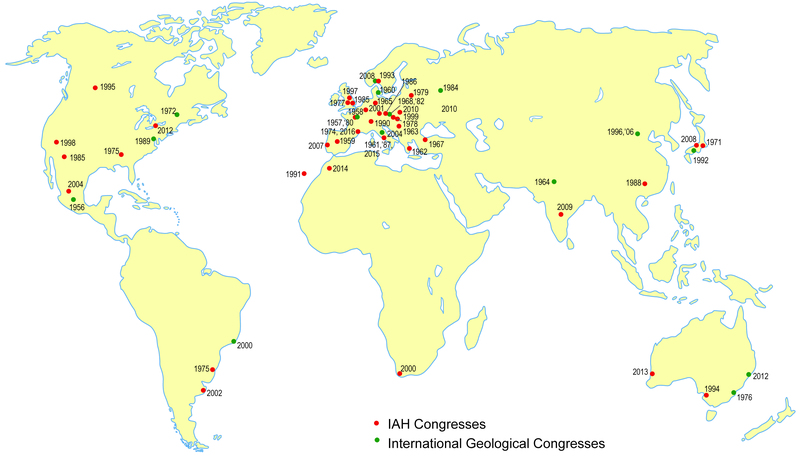 Other long-established IAH commissions were those on Mineral and Thermal Waters and on Karst, both of which date from 1968 and, like the Commission on Maps, have been major contributors to IAH’s congresses and book publications. More recent Commissions for Groundwater Protection, Urban Hydrogeology, Managing Aquifer Recharge and Transboundary Aquifer Management were established in response to the changing emphasis mentioned above. Newer Commissions on Groundwater and Climate Change, on Groundwater and Ecosystems and on Groundwater and Energy also reflect the changing directions of hydrogeological science. Over the years, IAH’s commissions have proved invaluable in bringing together like-minded individuals and will continue to do so in the future. The link below provides information on our present commissions and networks. IAH’s first books were the monographs and proceedings of the early IAH congresses in the 1960s and 1970s. The formal IAH book series was initiated with “Hydrogeology of Karstic Terrains, Case Histories” Burger and Dubertret in 1984. 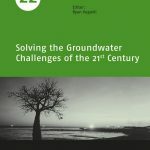 To date the Association has published 28 books in its “International Contributions to Hydrogeology” (blue book) series, ICH28 being the “History of Hydrogeology” Howden and Mather, and 23 books in its “Selected Papers” (green book) series, with SP23 being “Karst without Boundaries” edited by Zoran Stevanović, Neven Krešić and Neno Kukurić. In 2011 IAH made its out-of-print books in these two series freely available to download. A long-term ambition of the Association was to produce its own Journal. This came to fruition in 1992 when Applied Hydrogeology began publication with Heise. The title was changed to Hydrogeology Journal in 1995 and its publication was moved to Springer in 1997, since which time it has grown into the present high quality journal published in eight issues per year containing around 130 articles and nearly 2000 pages and a steadily increasing impact factor. Wider recognition for Hydrogeology Journal came from the decision of the Geological Society of America to co-sponsor the publication, and its stature continues to grow worldwide. From its beginnings, IAH has been indebted to the many individuals who have served the interests of the association on successive Councils, overseeing its management and considering future developments.In the early years, officers and membership of the association were dominantly in Europe, with French and German hydrogeologists in particular played defining roles and the administration of IAH was undertaken in Paris from IAH’s foundation until 1979. Between 1980 and 1989 the association was administered from the Netherlands and since then from the UK. As IAH has grown into an organisation of over 4100 spread throughout the world, the structure and governance of the association needed to evolve accordingly. Thus, in 2000 IAH became incorporated as a company and registered as a charity in the UK. The Memorandum and Articles of Association and the accompanying Rules set the governance and management of IAH on a foundation that was more appropriate to its growing size and complexity. Recognising the importance of history at a more personal level, IAH established the Hydrogeologist Time Capsule Project. This provides a substantial collection of video interviews of eminent hydrogeologists who have made a material difference to our profession, many of which are augmented by profiles published in the Hydrogeology Journal.